A common-emitter amplifier circuit has been added to the previous circuit. This is based upon the use of a 2N3904 PNP transistor. This is designed to boost the output of the original signal from a magnitude of a few millivolts RMS AC to approximately 15 to 30mV RMS AC. This design appears to be successful in this regard. Work is currently underway to develop and integrate into the circuit a loop antenna to serve direction finding research goals. 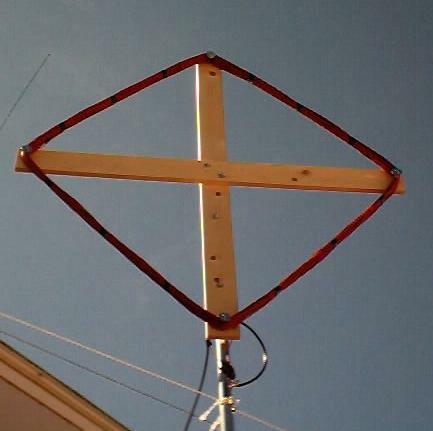 The antenna frame consists of two 1″ by 4″ x 4 ft. pieces of lumber bolted at right angles to one another in the center of each piece. This forms a square frame for the wire. 2 1/2″ bolts are attached near the end of each wooden piece with fender washers at the outside edge of each bolt to contain the wire as it is looped around the wooden frame. 500 ft. of No. 14 insulated solid copper wire is neatly wrapped around the frame using the end bolts for support and containment of the wire. The wire starts and stops at any one end of the wooden frame. Two holes are drilled at the end of this same wooden frame piece to contain the leads of the antenna. The wooden frame is mounted onto an aluminum or steel mast of 10 feet height, and will have the appearance of a diamond by mounting one of the boards to the mast. The antenna leads feed out from the bottom of the frame structure and are connected to RG58 coax cable and fed into the ELF circuit. The thickness of the wire will be approximately 1 inch by the time it is all wound. Parallel resonance is achieved by placing a capacitor across the output leads of the antenna prior to the coax connection. Different values of capacitance will vary the resonant frequency according to the relation : fr = 1 / (2 * pi * (LC) 1/2) where L is the inductance of the coil in henries, C is the capacitance in farads, and fr is the resonant frequency in Hz. Different values of capacitance are being experimented with, currently ranging from 4nF (resonant frequency :~ 32.5kHz) to 3.3uF (resonant frequency : ~1132Hz) to 11300 uF (resonant frequency : ~20Hz). The inductance of the coil above is calculated and independently measured as approximately 6mH. This antenna is to be considered as a small loop antenna with the primary electrical field strength occurring in the direction of the plane of the antenna. Primary magnetic field sensitivity is perpendicular to the plane of the antenna. Additional information on loop antennas can be found within the Practical Antenna Handbook, by Joseph Carr, Fourth Edition, 2001. The loop antenna as described here replaces the Hammond 15H inductor which is shown in the circuit diagram above. The advantage of the loop antenna over the 15H inductor (filter choke) is that the loop antenna can be used for direction finding purposes to help identify the origin and location of the signals received. It will be advantage to perform data logging with the use of a non-cathode ray based computer, such as a laptop. It has been learned that the influence of a cathode ray tube which is placed in proximity to the loop antenna will produce a mixed signal which is more difficult to interpret. The orientation of the CRT with respect to the directional antenna will also have an effect (this appears to be creating an interaction between local electric and larger scale geomagnetic fields. The use of a mixed or heterodyned signal is recommended for a later analysis. Efforts have been taken to reduce all 60Hz and powered equipment as much as is possible, and significant changes in the received signals does occur as a result. It appears that modulation, mixing and or heterodyning may still be a factor in the signals that are being received, even when the cathode ray tube influence is removed. Spectral analysis indicates that a fundamental frequency of 10Hz is present with the ELF range being monitored. Sums and differences of 4Hz and/or 6 Hz are under increased scrutiny. Maximum signal strength continues to be in the direction of the magnetic field lines of the earth. Additional information will be provided as additional tests are run under these quieted conditions. View of Loop Antenna from the ground. Each board measures 1″ x 4″ x 4ft. Antenna leads are fed through two holes drilled through board at lowest point of antenna. 2 1/2″ bolts with fender washers mounted on end of bolts contain wire. Wire is 500 ft. long, 14 gauge copper solid. Capacitor is mounted across leads (parallel resonance) of antenna prior to lead connections to RG558 coax cable. See additional text description. The audio amplifier added to the output of the ELF circuit as it is shown above can be purchased from Radio Shack for approximately $12. 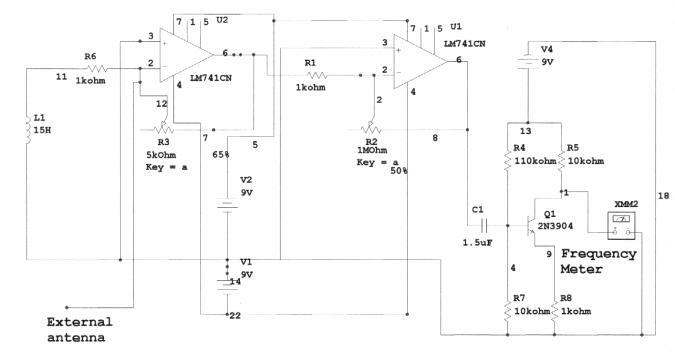 Input sensitivity of the amplifier is 1mV and the part number is 277-1008. The digital oscilloscope-spectrum analyzer is model ADC-40 from PicoTech (www.picotech.com). This logging oscilloscope-spectrum analyzer circuit plugs into the parallel port of a computer and can be used to analyze frequencies to 10kHz. A 18mH filter choke has been added in series to the coil of the directional antenna. This brings the total inductance to approximately 24mH. The capacitors being used in parallel resonance now vary from 2pF to 56pF. Credit is given to an independent researcher for direct measurement and verification of the original loop inductance as approximately 6mH. The schematic above shows the ELF circuit as it is being used in the most recent testing and experimentation reported on this site. The circuit is reasonably simple; it is the result of considerable design, simulation, experimental, trial and error work. It is expected that the circuit can be improved and suggestions are welcome to that effect. Any detailed analysis of the circuit and its performance are welcome. The circuit has been considerably simplified since the original incarnation that uses a TL082 operational amplifier. The circuit is being presented in the most basic form only; obvious refinements such as power switches will be included at a later time. Those with electrical engineering knowledge are welcome to comment on the circuit and any inherent weaknesses or suggested improvements. There is a marked difference in performance between the original investigated circuit and the recent modifications that are shown. Both sensitivity and bandwidth performance appear to be noticeably improved. The external antenna appears to improve the signal strength. A wire of several feet in length has been used, as well as the human body, and the combination of both. All variations have an effect upon the signal strength, and the gain setting is regulated for each. The first potentiometer can be regulated to vary the gain of the circuit. Voltage minimums in combination with various antenna configurations appear to be important under certain test conditions. All wire junctions shown without a dot at the node are crossovers. Crossing wires are NOT connected unless a dot occurs at the junction of the wires. The initial success of the circuit should be able to be tested with the ambient 60Hz power line signals; from that point experimentation with the gain control and various antenna configurations can be investigated. Considerable patience and experimentation may be required to fully exploit the range of sensitivity of the circuit. Users are welcome to report any problems or questions and all will be evaluated; responses will occur as time permits. The circuit now exists only in breadboard form, as revisions have been frequent and common. It will be beneficial if citizens in other locations of the nation or globe will construct this circuit (or any improved version) and report their results. Please also refer to additional requests for assistance that have previously been made. Serious inquires may be directed to cec102@usa.com, however, responses can only be provided as time and circumstances permit. All inquiries will be considered and evaluated. This circuit is subject to continuous revision and additional reports will presented as time and circumstances permit. The Hammond 15H inductor is not needed if the directional loop antenna is constructed. Radio Shack, Part No. 276-007. Knowledgeable designers are invited to recommend changes to this circuit for improved performance. Input sensitivity at the lower frequency range is stated as 50mV rms. Data logging software is Meter View 1.0 included with the multimeter, along with the serial interface cable.